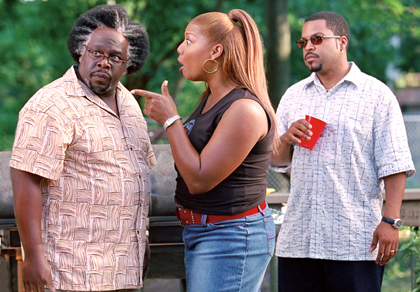 'PLAYING THE DOZENS': Gina (Queen Lativah, center) gives Eddie (Cedric the Entertainer, left) a piece of her mind while Calvin (Ice Cube) looks on.end caption. When Barbershop 1 was released in the fall of 2002, the picture was criticized because of its disrespectful depictions of civil rights era icons like Dr. Martin Luther King, Rosa Parks, and Jesse Jackson. But the well-aired debate over its irreverent brand of humor certainly served to stimulate considerable interest in the movie, with the hubbub elevating a mediocre B comedy into a runaway hit. The highly anticipated Barbershop 2 won't need any controversy to get its share of attention, though this uninspired sequel is little more than an extended acrimonious indulgence in trite personal insults, better known as "playing the dozens." The dozens, an integral aspect of African-American culture, is a mean-spirited taunting in which participants belittle each other's mother, IQ, economic status, body odor, desirability, physique, skin color, hair texture, and more. Gangsta rapper Ice Cube reprises his lead role as Calvin, the proprietor of the 'hood-based hangout, while Cedric the Entertainer again co-stars as Eddie, the trash-talking old-timer prone to shoot from the lip. Also returning are seven other original cast members: Jazmin Lewis as Calvin's wife Jennifer, Sean Patrick Thomas as ex-barber-turned-politico Jimmy, Parvesh Cheena as Samir, and Calvin's colorful crew of hair-snipping employees as played by Leonard Earl Howze (Dinka), Eve (Terri), Isaac Rosenberg (Troy), and Michael Ealy (Ricky). The only significant additions arrive in Oscar nominee Queen Latifah (Chicago) and Kenan Thompson (Good Burger). This time Eddie's biting, politically incorrect humor is replaced by an array of indiscriminately offensive, personal asides. For example, when a little girl complains that her barbecued hamburger is burnt, he responds with, "That ain't burnt," before pointing at a dark-skinned man, saying, "See that brother over there? That's burnt." When the child threatens to tell her mother about his rudeness, he responds with, "Go ahead and run to the crack house and tell her." On another occasion, he presumably gets the better of the African-born Dinka by saying, "If you don't knock the fork out of my hands, I won't knock the spear out of yours." But the big showdown, which I won't spoil for fans of this brand of incessant one upmanship, is reserved for a face-off with Gina (Latifah), the sassy stylist from the beauty salon next-door. When not degenerating into yo' mama style jive, the movie takes potshots at a few easy targets like the Nation of Islam, Condoleeza Rice ("needs a make-over"), and alleged child molesters R. Kelly and Michael Jackson. Much of the subject-matter is insensitively in bad taste, such as when the D.C. snipers are celebrated as heroes, "The Jackie Robinsons of crime," for being the first black serial killers. The familiar "impersonal corporation versus virtuous mom-and-pop operation" plot line is just a lame excuse to string together a series of unfunny putdowns. The story was shamelessly lifted from Good Burger, the Nickelodeon kiddie film also featuring Mr. Thompson. In that film, a local hamburger joint was being threatened by a mega chain conglomerate set to open a high-tech franchise right across the street. In Barbershop 2, a Nappy Cutz outlet, offering state-of-the-art service, is invading the neighborhood and threatening to drain away all of Calvin's customers. This sequel was shot by replacement Kevin Rodney Sullivan, a man who must take a hit for okaying an abysmal script. Otherwise, he must have given his ensemble cast free rein to improvise, enabling the dialogue to degenerate invariably into the sort of schoolyard jokes about religious faiths, genetic traits, and sexuality which only work if you enjoy laughing at people because they are darker-skinned, or curlier-haired, or perverted, or have emigrated from another continent. On top of that, Barbershop 2 was beset by a host of production problems such as atrocious sound quality. Eddie's mumbling is so unintelligible that subtitles should have been added to assist those unschooled in Ebonics. Not that any of the above is likely to discourage fans of Cedric, Latifah, and Ice Cube from rushing out to catch this fiasco. Fair (one star). Rated PG-13 for profanity, drug references, and sexual content.